Also the usual adventure on the tractor trailer rides, milking demonstration, sheep shearing (tbc), BBQ, lots of our cheese to sample and local stalls. We’ve been busy in the last few weeks with lambing and the first batch of kidding. Lots of twins and triplets so the ‘nursery’ is full of life. Here’s a picture of Ali holding Tiny Timmy. Plenty more due so if you’re coming camping at Easter you might get to see some live births, or at least help with some bottle-feeding. Been a fantastic summer – lots of sunshine so a really busy summer-holiday season. Winding down now now so anyone looking for an extra quiet break, get in touch. 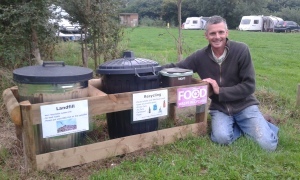 We’ve put in new recycling bins on each pitch – hopefully this will make things even easier to recycle (and less sorting for Ian). Been doing some trials on goats milk ice-cream and some lovely thick yoghurt. The first batches of hard cheese are ready for tasting – so far so good, hopefully be on sale soon. Check this out!!! Must be getting something right. Looking forward to another busy year on the farm. 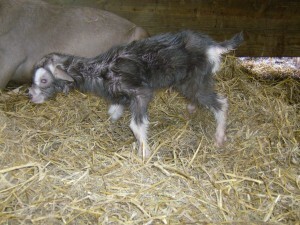 The first lambs have been born – triplets, all doing well. First batch of goat kids due in March and more lambs due in April. We’ll be putting up some new buildings – we would have liked to have got started already but the rain has put a bit of a damper on things! Cheese going really well so we’re going to be branching out into hard cheese and also halloumi – perfect for barbecues. 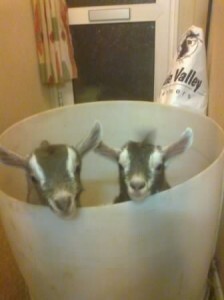 Goat kid meat has also been really popular so we’ll make sure we’re always stocked up. Look forward to seeing you in 2014. This year we are taking part in the nationwide ‘Open Farm Sunday’ event. 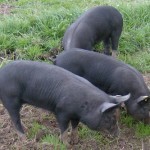 Its a chance for people to visit farms and see first-hand what happens on a farm and discover where our food comes from. – Produce to sample as well as the grand opening of our farm shop! The first kids of the year have been born. With plenty more due at the end of March. The compost loos are moments away from being finished, just need to get the water connected and put up some curtains. A new pipe has gone in to take rainwater and surface water down to our wildlife pond – currently piles of earth everywhere but hopefully when we’ve got all the pipes in, we can get all back to normal. 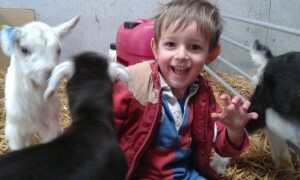 Will has come to work for us, helping out with goats. And of course our second little boy was born on 12th Jan.
Ali, our 2 year old, finally got around to learning to walk and is now “helping” with the goats. 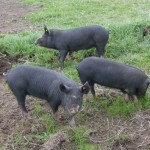 Look forward to seeing campers old and new this year..
Our new pigs. 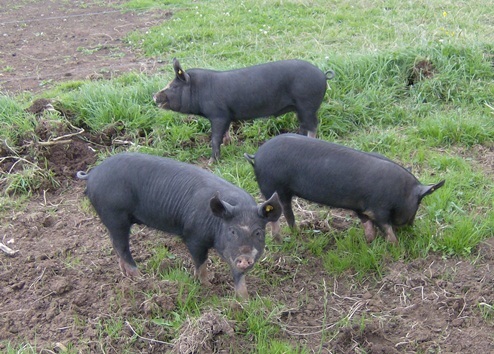 We went off to the market yesterday – there were some more Oxford Sandy and Blacks, which were the breed we had last time, but they were in batches of 7 and we thought that might be too many. There were also two pens with three Berkshires in each. 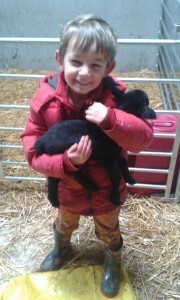 10 weeks old, in very healthy condition so we bid for them and got the 2nd pen. It took them about half an hour to break out, into the goat paddock so they were all having a great run around the field! They’ve also wasted no time digging up the grass – I think we had it easy with the Sandy and Blacks. Time will tell. We store all produce in the freezer (even milk), so please allow time for defrosting. 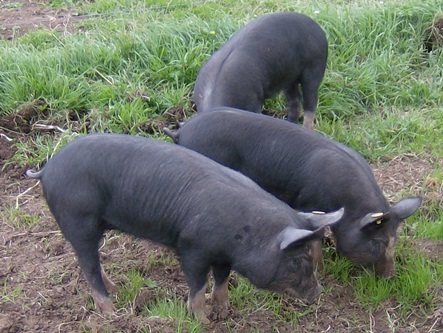 All pork comes from our own home-grown pigs.